After the fun and games of the weekend, my legs were trashed. Charlie Murphy went to work on them! Think this is from Marcus who was at the invitational - check out my speedy double unders...and super slow running! Flew over early Friday morning and spent the day in the gym helping Colm get it ready. Cinema and Ice Cream on Friday night seemed like great preparation for the fun and games ahead. On arriving at the gym, I could see a few faces I recognised from Facebook and frums etc, but also a lot of faces I didnt know. I also spotted a lot of nervouse faces too. There were 18 people taking part on the day - 16 guys and 2 girls. After regiserting and saying hi to some new people and some old ones, it was time for the formal introductions and movement standards from Colm. I managed to get 6 rounds plus 2 wall ball, with the last set of OHS killing me, just couldnt stabiles it over head. This got me tied for 5th place. Was feeling good for this one, but wasnt sure how my back would hold up. I started off doing push jerks, but after 5 or 6 got a pain in my back and had to unceremoniously dump the weight and recompose myself. I managed another couple of reps but changed to split jerks ( which I should have done from the start ). Got 9 reps in total for this event which moved me up to 3rd place overall. So over all, I finished in 4th place. Im so chuffed that I managed to get such a high placing as there were some fierce competitors there, especially the guys from CF Ireland. Colm is making some future monsters. Saturday night was a meal at Captain Americas in Dublin, followed by a pub ( cant remember the name ) but I was so tired, I was nearly sleeping standing up! Sunday morning was not pleasant, with almost everything apart from my hair hurting. Colm, Ruairi, Peanuts and me sat and watched a couple of episodes of That 70's Show before Colm gave me a lift to the airport. Flight was a bit delayed but managed to get home for 3pm. I had a fantastic time, with great people and some great workouts. This is why I CrossFit! So you may have noticed...or you may not have....or you may not even care one little bit..that I havent posted all week. Well, on Friday while I was at work in Asda ( yeah, I know) the local council phoned the house to see if I was still interested in supply work as an Additional Support Needs (ASN) in local schools. An ASN is like a classroom assistant but instead of working as an assistant for the teacher and the whole class, you are responsible for one cold who needs extra assistance. I phoned back on Monday, they phoned the school that was looking for a supply ASN, the school phoned me, I went up for an interview...and stated work on Tuesday! I am now working 4 days in the school, 2 days in Asda, 1 day in college. Glasgow Half Marathon - done! 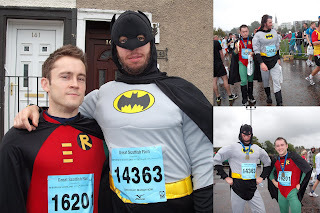 So we did it again this year, but to make it a bit more fun we did it as Batman and Robin. Was aimig for sub 15 so happy with that. Man, squat cleans kill me!